Weighty Matters: IWK Health Centre Hospital Leads, Stops Soda and Juice Sales. IWK Health Centre Hospital Leads, Stops Soda and Juice Sales. We've created a world whereby the default option is usually junk, and where if you're trying to eat healthfully saying "no" to crap is almost a continuous requirement. Wouldn't it be great if it were the other way around? Where the crap was there if you sought it out, but where the default was healthful? 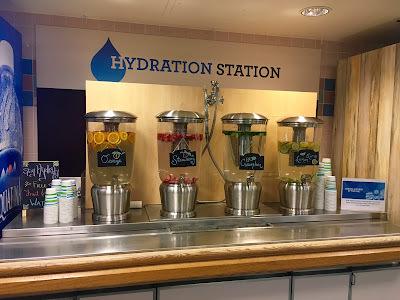 Well Halifax' IWK Health Centre Hospital has got your back - last week they stopped selling sodas (both sugar sweetened and artificially sweetened), sport drinks, and juice and in their stead, installed free infused water "hydration stations". This is the sort of leadership I expect from hospitals (see this editorial I co-authored back in 2008 calling out hospitals' deep-fried hypocrisy) but which is so rarely seen. Huge kudos to IWK Health Centre, and here's hoping other hospitals, schools, arenas, libraries, government offices, and more take note that some profits just aren't worth it.